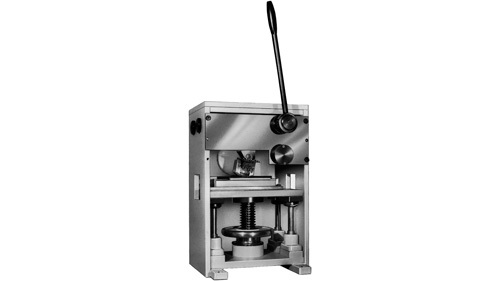 This medium manual roller embossing machine lets you emboss flat work pieces and round material at the circumference lengthwise and diagonal to the axis. The large selection of additional devices also makes it possible to equip even complicated work pieces with multi-line text, scales, consecutive numbers and circular imprints. The embossing depth allows the retrospective processing of the parts. The embossing machine is adjusted with the hand wheel below the embossing table. The parts are inserted manually.